RF output ranges from 45 to 860 MHz, covering both VHF and UHF band. Low pass filter is installed for each of the six output frequency band to filter out high-order harmonic oscillations thereby avoid inter-channel interference. 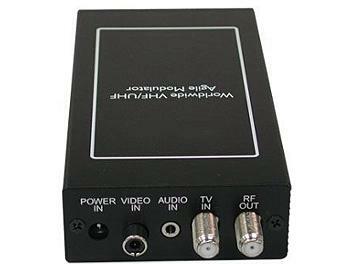 RF output available in 12 worldwide TV/Cable channel systems. Customer can easily choose one that is most suitable to this application. The 12 systems are NTSC M Air/Cable, PAL B/G Air/Cable, PAL A/I Air/Cable, PAL D/K Air/Cable, PAL B/H Air Australia, PAL B/H Air NZ, and SECAM L/L'. Output level is adjustable between 90 and 113 dBuV. Aural/visual Carrier Ratio adjustable between -11 dB and -18dB(option). Visual Modulation Depth adjustable between 75 % +/- 10%. Easy push button channel up/down control. Modulation type: Double side band modulation.